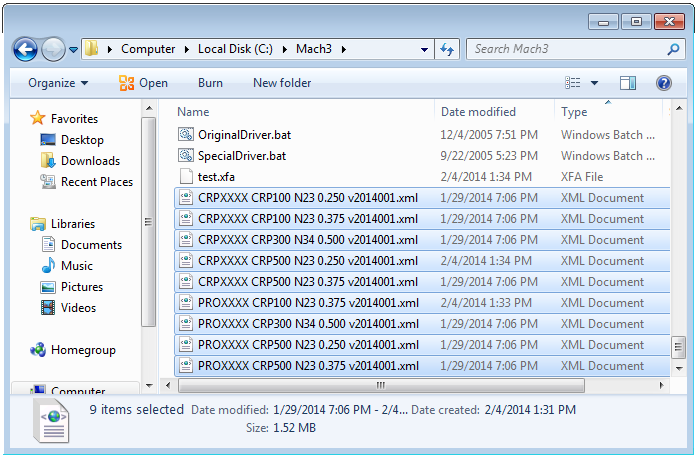 These XML configuration files provide an easy way to set up Mach3 to work with our various hardware and electronics packages. While some tweaks may be required for your particular setup, these files will get you most of the way there. Any changes you make to the Mach setup can be saved to the XML file using the Config->Save Settings menu selection. If you need a Mach3 license, you can purchase one right here through our store in the Software section. The Model of your CNC Machine. CRP800 - our Plug and Play NEMA 23 CNC Control System or Plug and Play NEMA 34 CNC Control System. CRP100 - DIY packages with our NEMA 23 motors and the Leadshine MX3660, Leadshine MX4660 or Gecko G540 stepper drivers. Note: For machines with NEMA 23 motors, our NEMA 23 Stepper Motors with 3/8" Shafts are standard and are always recommended. Unless you specifically requested 1/4" shaft motors with your order, you should have 3/8" shaft motors. For custom CNC machine sizes, simply choose the configuration for the closest machine size available below and adjust the soft-limits settings accordingly. If you have any difficulty identifying your CNC Machine Model, Electronics Version, Motor Type, or Cutting Tool, please Contact Us and we will be happy to help! If you purchased a dual-purpose machine, you will need two configuration files, one for each cutting tool. For example, one for Spindle and one for Plasma (with all other machine details identical). 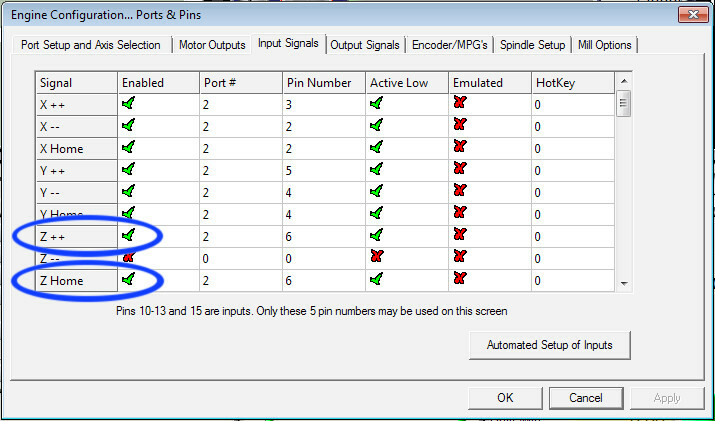 The default speeds in the configuration files we provide below are set to very conservative initial values. As you work and become more familiar with your CNC machine, you can adjust these settings to achieve the much faster rapid and cutting speeds that your machine is capable of achieving. 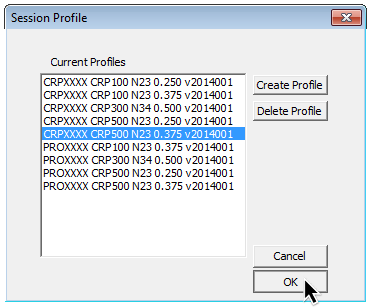 * For CRP800 electronics purchased before July 2015, you will need the "revA" version of the XML configuration, all newer systems will need the "current" version. CRP300 - DIY packages with with our NEMA 34 motors, Gecko G201X or G203V drivers, and PMDX-126 breakout boards. CRP500 - older versions of our Plug and Play electronics systems built prior to February 2015, with our NEMA 23 motors paired with our CRP5042 digital drivers and breakout board, in the same NEMA enclouse as our current CRP800 systems. Close Mach3 if it is currently running. The new profile(s) will now appear in a list of selectable profiles. Highlight the profile you wish to use and hit "Ok" to load it. 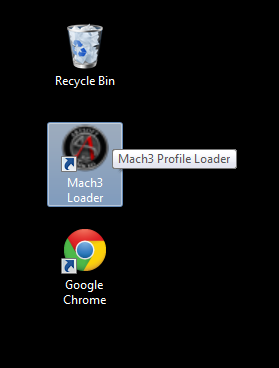 When Mach 3 loads, you should now see the profile name in the lower right hand corner of the screen in a box labeled "profile"
Enable the Z Home / Z+ Limit switch (if equipped). 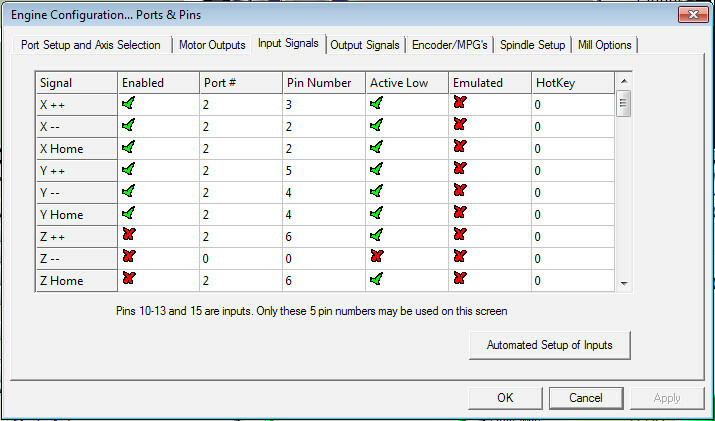 Open the Config Menu and select the "Ports and Pins" option, and navigate to the "Input Signals" tab. Check the "Enabled" setting for "Z++ " and "Z Home".